Imagine yourself grinning ear to ear as you listen to a live orchestra performing the powerful and iconic opening scene to Star Wars. If this idea excites you, then you have to check out the Sci-Fi Spectacular at State Theatre New Jersey, January 7 and enjoy a musical afternoon with the talents of the NJSO playing compositions from Sci-Fi films classics such as Star Wars, Star Trek, Close Encounters of a Third Kind, and many more! A heavy influence on John Williams’ early style, especially for his work with Star Wars, was Richard Wagner. In the mid 1870’s Wagner produced a type of music closely related to “epic music dramas” and had a “cinematic” composition style to it. One of the tactics Williams favored the most was a distinct musical “voice” for each major character. This can be clearly seen in the various Star Wars with distinctive sounds and themes for characters such as Darth Vader, the Empire, and Luke Skywalker. Another influence on Williams was Tchaikovsky’s romantic style; the love theme for Han and Leia are reminiscing of the sound of Nutcracker and Swan Lake. Other areas where Williams’ work was influenced by other composers was with Korngold for the main Star Wars Theme, Orff for the duel with Darth Maul, and Stravinsky for the droids R2-D2 and C3PO wandering the dunes of Tatooine. NJSO will perform Williams music from Star Wars, Adventures on Earth, E.T., Superman March, and Close Encounters of the Third Kind. Calvin Custer spent most of his musical career at the Syracuse Symphony Orchestra. While in university, his composition mentors included Nikolai Lopatnikoff, Ernst Bacon, and Earl George, who were prominent musicians, composers, and visionaries in their works. Over the years Custer had many roles in the orchestra like playing the keyboard, horn, and sting bass, in addition to composing and conducting. Because of his time spent with his mentors, instead of simply playing music, he decided to compose arrangements—reconceptulizing previously created pieces. Some of these reconstructed compositions include "Adagio for Strings," "Ashokan Farewell," and "Rolling Thunder," in addition to popular scores from films and TV such as the theme from Batman, Star Wars, and 007. As time went on these altered versions were performed all across the U.S. and audiences gave him and the orchestra standing ovations. NJSO will perform Custer's music from Star Trek through the Years. Michael Giacchino has been enthralled by music since he was a young child. When he saw films like Star Wars, Raiders of the Lost Ark, E.T., and Poltergeist he thought to himself that he wanted some sort of career in the film industry. He would bring a cassette recorder to the movie theater and record films and listen and analyze how sound, music, and dialogue worked together. Once he returned home from school, he spent all his spare time making little movies. He would also watch many shows to further his understanding of film, sound, and production. Once he attended the School of Visual Arts in New York, he had an epiphany that the most important part to a film is intertwining the right music and since then he has been a quest to do that to every score he writes. 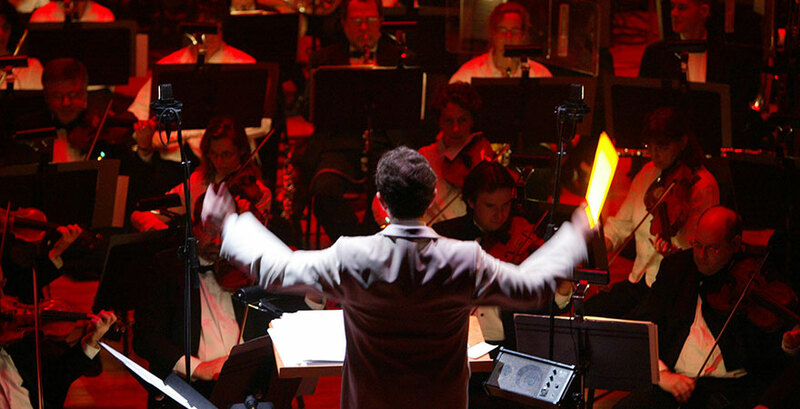 NJSO will perform Giacchino's music from the Star Trek film series directed by J.J. Abrams. Bernard Herrmann rooted himself in the Romantic/Neo-Romantic genre of music, the type that is personal and emotional. With this imaginative style of music he has been able to truly stir up emotions in the films he worked with, giving them deep, expressive detail. He has worked with dozens of historic filmmakers like Orson Welles, Alfred Hitchcock and composed pieces for films such as Citizen Kane, Psycho, Vertigo, and numerous other iconic films. NJSO will perform Herrmann's music from the film The Day the Earth Stood Still. Richard Stauss has worked with music since he was a very young age. Both his parents were musicians and instilled that love of music into him. At age four he began piano lessons and by age six he was already composing his own works; by age 18 Stauss had composed 140 pieces. At around that point he discovered Richard Wagner and fell in love with his sound. At 21, Hans von Bulow—one of the foremost conductors of Wagners, took him under his wing and mentored the young Stauss. At this point, his works were widely known and he kept working his way up, traveling around, learning from other mentors, and accepting various musical directing/composing positions. NJSO will perform Strauss's piece “Also Sprach Zarathustra” known from the film 2001: A Space Odyssey. John Barry’s love for music and film was well rooted in his family; his mother helped him as a child to learn the piano and he went to the movie theater with his father when he was older. When he saw the films in the theater he began to understand the power and influence music had on film. One film in particular that inspired this understanding was A Song To Remember. As he grew older Barry took up the trumpet and played in dance and jazz clubs. After playing in a band for a few years, he switched to the film industry where he composed scores for films like Beat Girl, Never Let Go, The Amorous Prawn, and later on scores for 11 James Bond films. NJSO will perform Barry's music from the film Somewhere in Time. Beam down to the State Theatre New Jersey, Sunday, January 7, 2017 at 3pm for the Sci-Fi Spectacular. Do you love Star Trek: The Next Generation? Well you’re in luck! We are excited to announce that Marina Sirtis, also known as Counselor Deanna Troi, will be hosting this out-of-this-world event. Make sure to point those ears up and feel the musical force!